Contact Form 7 Insightly CRM Integration is a Insightly CRM integration plugin for WordPress that makes it really simple to send your Contact Form 7 forms directly to your Insightly CRM account. After the integration, submited the form are automatically added as lead, opportunity or contact & organization to the specified account in Insightly CRM, together with additional data. 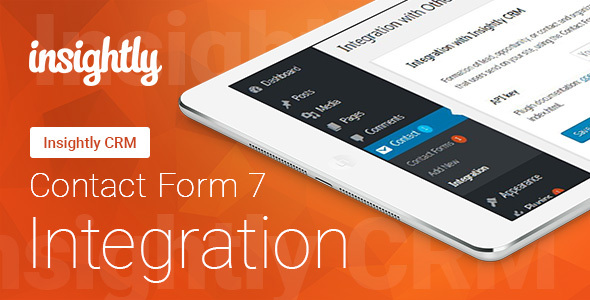 Integrate your Contact Form 7 forms with Insightly CRM. Integrate unlimited `Contact Form 7` forms. Compatible with `Contact Form 7 Multi-Step Forms`. (when configuring, you need to fill in the fields with all the steps in the last form).